Live near Chicago and looking to buy a new mattress? We’ve put together the following guide to help you find a store that works best for your location. Chicago has a number of nicknames, everything from “The Windy City” to “The City That Works.” Whether it be a long day at the office or fighting off a tough Chicago winter, we know that when you get home at night, your bedroom needs to feel like a place of rest. 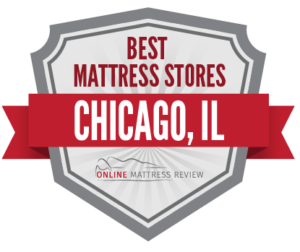 Wherever you are in Chicago, there is a quality mattress store that will help you-through quality customer service, wide selection, and great value. Find the mattress that is the perfect fit for you home and for your budget in Chicago below. Downtown Chicago is a great place to get active during the day- whether you keep your mind active or your body, you are going to need to grab some quality shut eye when the sun goes down. If you’re in the downtown area, Mattress Firm has found a spot in nearly every neighborhood of the city. If you value affordability and supporting smaller stores, we recommend you check out Far Below Retail (919 Larrabee St.). The mattresses are not only affordable but service is consistent and fast. If you are looking for a quality spot to furnish your home and fill your bedroom Far Below Retail is a real winner. American Mattress (207 S State St.) is located in The Loop and a fantastic option for quality mattresses. If you need a salesperson who is going to take the time to help you find the perfect mattress that meets your budget and sleep needs, American Mattress is a great place spot. Aspen Slumbers (6010 N Northwest Hwy) in Norwood Park provides quality mattresses that are comfortable and high value. You can get the best quality mattress at wholesale prices. This mattress shop provides a straghtword and seamless purchasing experience. American Mattress Harwood Heights (4602 N. Harlem Ave) provides phenomenal customer service and will work with you on your price. The mattresses include a wide range for all sorts of budgets and sleeping styles. Though a chain, American Mattress is family-owned. Chicago Cheap Mattress (4140 N. Kedzie Ave) is a great shop for individuals who are on a budget. The customer service is fantastic as is the price. They also offer top of the line pillow top mattresses. There is something for all budgets at Chicago Cheap Mattress. Wondering where to find a mattress near Chicago? Futons and More (1370 E. 53rd St.) is a great place to buy a mattress in South Chicago. Futons and More really has a central focus on mattresses and will sell you a mattress that you can find in their store, and if you are looking for something else, will order it for you. Expect to also find some great deals and sales events as well as next day delivery. Carpet Corner Furnishings (4555 S. Ashland Ave.) sells high quality furniture and mattresses at fair prices. You will be greeted with a warm and knowledgeable sales team and mattress is delivered promptly the following day. If you’re in Hyde Park, you may want to explore American Mattress- Hyde Park (1408 E. 53rd St.). The customer service is the same as being in a small mom and pop shop and you will leave with a mattress that fits your budget needs and your sleeping needs. Bob’s Discount Furniture (1370 Torrence Ave) is a great spot if you are looking to find a mattress and bed set at a price that does not break the bank. The staff is knowledgeable, bright, and friendly. This is a great option for people living in South Chicago. And if you are looking for a mattress near Chicago that is green and organic, we recommend you try My Green Mattress in La Grange. These are custom built organic and sustainable mattresses.